For some, a visit to Savannah is all about learning the storied history of this charming southern city; but for others, there’s a deep, dark past that is just as intriguing. Considered to be one of the most haunted cities in America, Savannah beckons paranormal enthusiasts and everyone who’s the least bit curious about ghosts. Read on to discover some of this city’s eeriest events that have made a significant impact on Savannah’s haunted history. A visit today to the naturally picturesque city may hinder your ability to imagine a time when shady and dangerous pirates frequented Savannah, coming into the harbor and causing more than their share of trouble and terror. 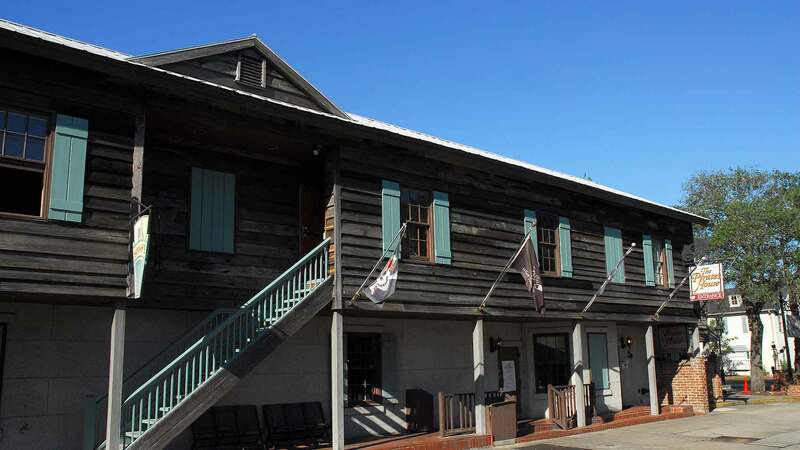 But if you happen to stop into the Pirate’s House, built in 1754, you’ll discover why so many consider this well-known restaurant a significant spot in Savannah’s haunted history. During its heyday, it was a place of refuge, among other things, to many sailors and locals. But it was during this time that pirates would kidnap unsuspecting patrons using the underground tunnels beneath the restaurant, which led to the Savannah River. They would force men into the tunnels and onto their ships, where the poor souls were left to live a life of servitude, never to be seen again by their families and friends. These events were undiscovered for years; but the ghosts that linger inside these tunnels and within the Pirate’s House restaurant have long haunted visitors. It was 1771 when James Habersham, Jr. began the construction of what is now the Olde Pink House, one of Savannah’s most most well-loved restaurants. It took more than 18 years to complete his family home because of numerous construction delays, including the British occupying the home during the war. One of the most disheartening problems to arise was that no matter how much paint Habersham applied to the house, the bricks would bleed into the plaster, continually turning the house from its desired red brick to a dainty pink color. The issue, whether with the bricks or the plaster, was one that Habersham couldn’t eliminate and for many years he and his descendants suffered ridicule from what should have been a trivial problem. The house, though, was not as much of a problem as the heartbreak Habersham suffered at the hands of his children. His sons, whom he adored, had a different point of view and went against all that Habersham believed in by siding with the patriot cause. They worked underground with the Sons of Liberty and fought against England in the Revolutionary War. Surviving the great fire of 1820, the War of 1812 and the Civil War, the mansion was occupied by many different people after Habersham passed away and the family sold it. But because of the many unpleasant events that occurred within the house and the rift between Habersham and his sons, there was a certain sadness that weighed heavy on the Olde Pink House. And it was these events that have caused spirits to continually haunt the mansion. It’s not unusual for spirits to linger in their homes, trying to make amends or somehow change what happened in the past. It’s no surprise that the most popular ghost spotted at the Olde Pink House is James Habersham, Jr. himself. Guests and staff have also reported seeing the apparitions of slave children and a young female slave in various spots within the restaurant. With the yellow fever epidemic in full swing in 1820, it wasn’t uncommon for massive amounts of people, sometimes an entire family, to die at once. And as one can imagine in the 1800s, the citizens of Savannah continued to suffer from other deaths either from accident, fire or tragedy. So when the designer of the 17Hundred90 Inn died in a riding accident before the construction of his masterpiece could be completed, it was written off as just another sad tragedy; but to one person his death meant much more. His young bride, Anne Powell, who is said to have never loved her older husband, was actually in love with a sailor who legend tells us visited the inn after its completion. There are many different versions of Anne’s story; but the one common thread is that she was heartbroken after she got pregnant with the sailor and took her own life by jumping off the balcony of Room 204 at the 17Hundred90 Inn. Since then, visitors to the hotel, especially those who stay in Room 204, tell accounts of seeing the ghost of Anne. There are many different stories of her presence; some say she messes up the sheets on the bed after it’s been made and others have heard her sobbing. Others report waking up to the sight of Anne standing over them crying and then turning to jump out the window. Because of this event, the hotel used to require that guests staying in Room 204 sign a waiver stating they wouldn’t ask for their money back; but because of its popularity among ghost hunters, the waiver is no longer required. 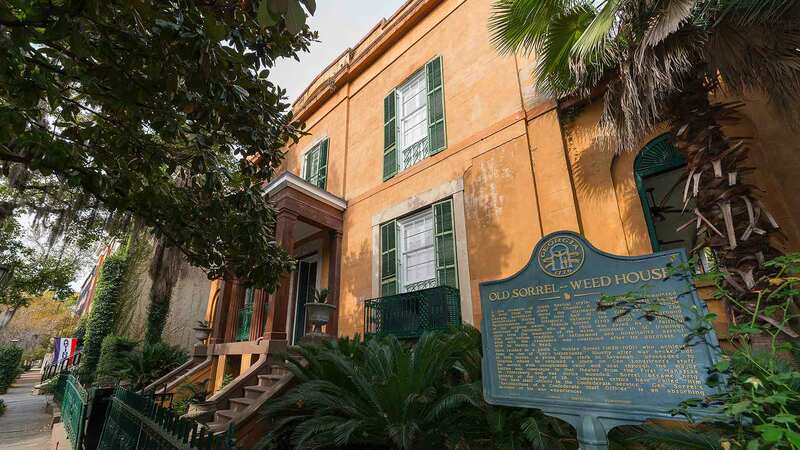 The Sorrel-Weed House, deemed by many as one of Savannah’s most haunted houses, has a history that’s riddled with tragedy and death. But there was a single historic event that paranormal experts believe may have caused it to become a hotbed for ghostly activity. You may have heard the stories of two brutal suicides that occurred at the Sorrel-Weed house. One was Matilda Sorrel, the wife of the home’s owner, Francis. And the other was a young slave named Molly, who was supposedly involved in a torrid love affair with Francis. Accounts of their suicides vary; but many historians believe these deaths actually took place at another location, just down the block. While these events surely had an impact on the family who lived there, and perhaps even contributed to the eerie ambiance of the home, there was a single event that is believed to have caused the Sorrel-Weed House to become a hotbed for ghostly activity. The house was built not long after the American Revolutionary War. And the site of the Sorrel-Weed House happens to be the same place where the Siege of Savannah occurred. Many soldiers were massacred during this battle which became known as the bloodiest hour of the entire American Revolution. And it’s for this reason the battle is believed to be the true cause of so many spirits lingering around the Sorrel-Weed House. 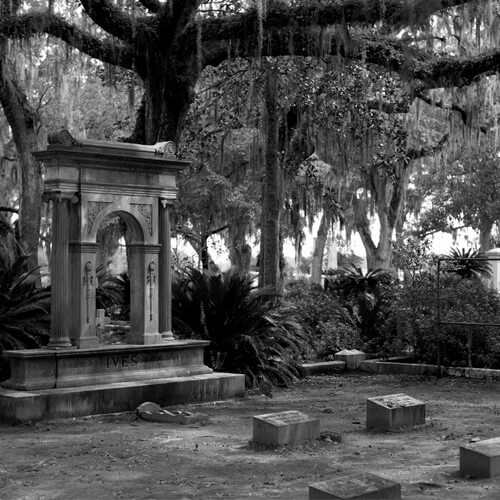 Most folks would agree that the most likely place for ghosts anywhere in the world would be in a cemetery; and Savannah’s Colonial Park Cemetery is no exception. 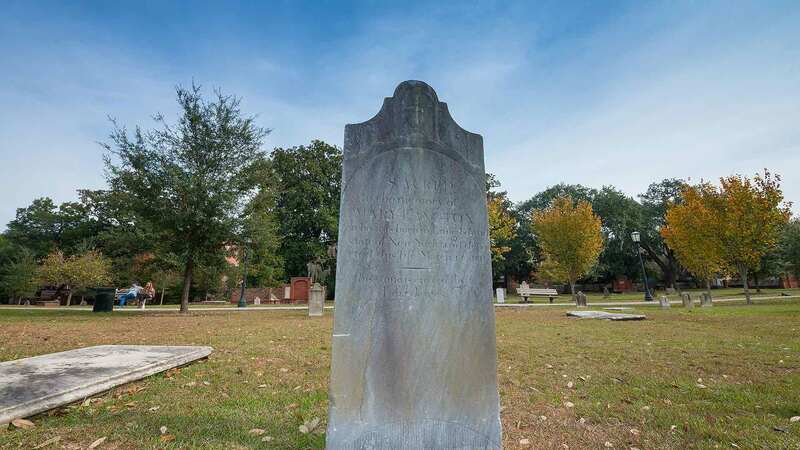 Considered to be one of Savannah’s most haunted places, this burial ground was opened in 1750 and is the final resting place of more than 10,000 people, many of whom were buried in mass graves. And although that fact alone is reason enough to cause spirits to be restless, there is another event in the city’s history that could be the cause of so much haunted activity. During the Civil War, the Federal Troops took occupation of the cemetery and used it as a headquarters for their soldiers during the take-over of Savannah. The soldiers were less than respectful to these hallowed grounds. In fact, they were down right malicious and proceeded to desecrate graves, damage headstones and even shot up many of them. The spirits of the dead were not just angry, they were set for revenge and it’s this reason that many visitors to the cemetery experience eerie sensations, cold spots and witness glowing orbs floating about. Established in 1846, Bonaventure Cemetery is known for its magnificent beauty; but many visitors flock to this historic cemetery to discover if the stories of hauntings are real. As you walk beneath the canopy of towering oaks, dripping with Spanish Moss, among the tombstones and mausoleums, you wonder how something so beautiful can have such a tumultuous past. And while there have been numerous accounts of ghost sightings, even the disembodied sound of vicious dogs snarling and barking, the tragic death of a young Savannah girl is perhaps an event that causes continued mysterious hauntings. Gracie Watson, just six-years-old when she died, was laid to rest in Bonaventure. Here, an angel statue marks the grave of this beautiful little girl who was taken all too soon. If that isn’t sad enough, those who visit the cemetery have reported seeing the statue crying real tears and hearing the voice of a child sobbing. 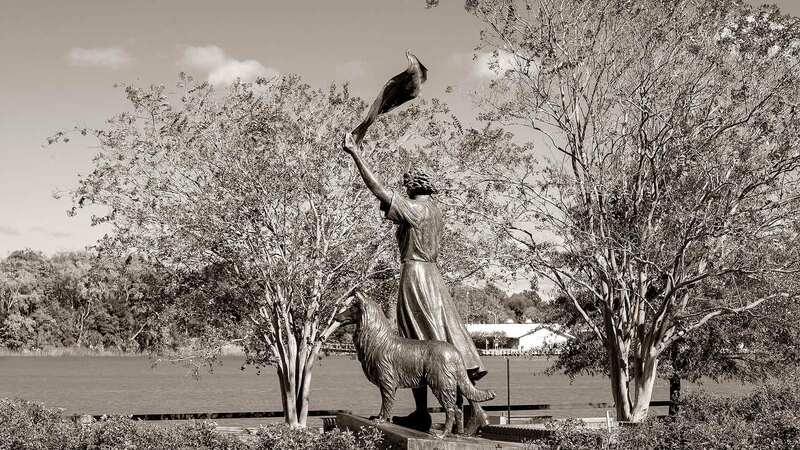 For 44 years, Florence Martus welcomed boats into the Savannah harbor by waving a white cloth. Some believed it was her apron or a lantern from the front lawn of the lighthouse where she lived. Nobody ever truly confirmed what prompted Florence to begin this practice; but some say that she had fallen in love with a sailor who promised to return for her. When he did not, legend has it that she would wave to each and every boat in the hopes that he would be on one of them and spot her. It’s estimated that nearly 50,000 boats were treated to her warm and friendly greeting over the years. Word even spread all over the world to ship captains and crews to look for Florence when they traveled into Savannah. But when Florence died with her love unrequited, she refused to give up hope. Her persistence lived on in the form of her spirit, which many have seen since her passing. 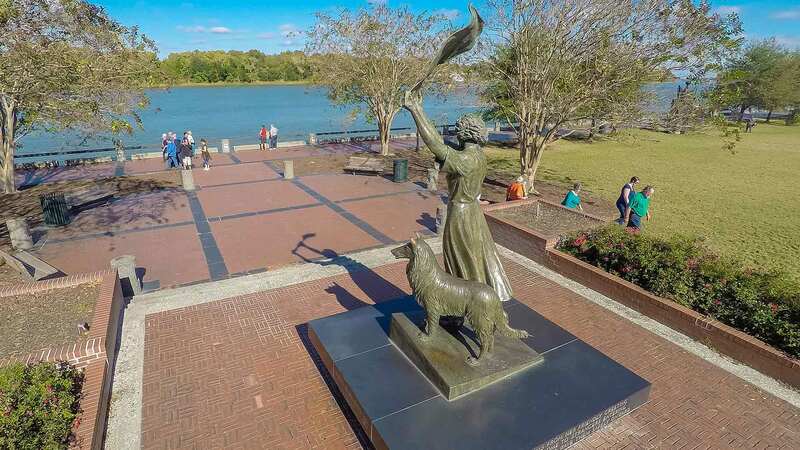 While the beloved Waving Girl Statue stands as a tribute to her, Florence’s ghost is still there, waving to ships from the lighthouse grounds as they near the entrance to the harbor.